During the Assessment process the ENT surgeon at the cochlear implant centre will have explained what takes place during the operation. Some three to four weeks prior to this you will be given a prescription to take to your GP in order to have a pneumococcal vaccination which is a preventive measure against possible infection. During the operation the surgeon will make a modest incision behind the ear being treated in order to gain access into the middle ear and cochlea. The surrounding area behind the ear will be shaved to facilitate this and the hair removed will quickly regrow. 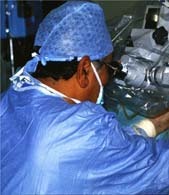 The operation lasts about three hours and typically you will be kept in overnight prior to discharge. While still in the operating theatre the implant will be tested and the electrical response of the auditory nerve may be recorded. An X-ray will be taken in order to verify the exact placement of the electrode assembly within the cochlea and you may well be shown this. The operation exposes the middle ear, creates access to the cochlea for the electrode array and provides a place under the muscle covering the skull to anchor the internal implant receiver. It is delicate and intricate rather than dangerous because no vital organs are disturbed. There are no serious attendant risks with this operation beyond those normally associated with major surgery. You may suffer some reaction to the anaesthetic and your sense of balance may be disturbed for a few days. It is not uncommon to experience strange tastes which can be described as metallic or in some instances a loss of taste sensation on the same side of the tongue as the implant. This can arise from disturbance of the facial nerve during the operation though this is carefully monitored by sensors during the procedure. The disturbance of taste will disappear within a few weeks. At discharge you may be given a course of antibiotics for the first ten days and if there are any difficulties in the incision healing process you should return to the implant centre immediately. You will be requested not to wash your hair for three weeks during this healing process but there are no other restrictions on your normal activities. You may care to view a webcast of a live sequential bilateral operation on a 3 year old boy in Cleveland, Ohio, USA .The video is subtitled and has a full running commentary both by the surgeon and an audiologist with explanatory slide presentations. The video may be seen here. Parents can also learn of children’s experiences in a Booklet ‘Tell It Like It Is’ (published by CICS). Send an email to info@cicsgroup.org.uk to get a copy.